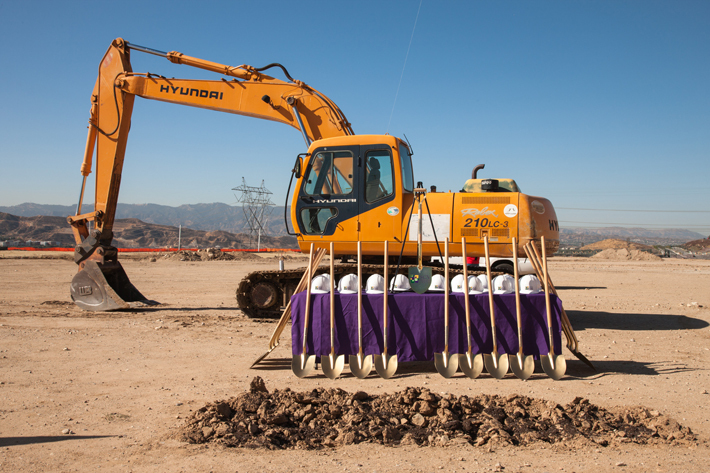 The 2.5-acre site, already peppered with construction equipment, became a makeshift party location as the groundbreaking took a celebratory tone. "We're so grateful for those who've paved the way to bring us here to Golden Valley," said SCV Senior Center Executive Director Kevin MacDonald, playing off both the street name and the poetic promise of the new Center. Representatives from state and local governments, community dignitaries and the Campaign team pose for the first official Groundbreaking photo of the afternoon. 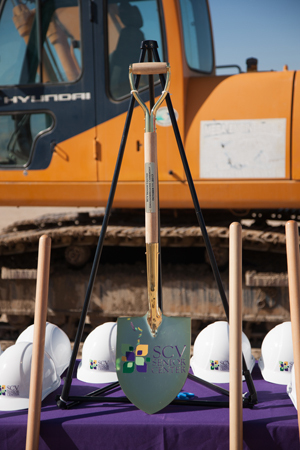 The site presented, "unbelievable opportunity for a brand-new Center in Santa Clarita," said Don Kimball, board member emeritus of the SCV Senior Center. "This is a central location for today - and tomorrow." SCV Senior Center Executive Director Kevin MacDonald addressed the crowd, saying, "We're here to turn a page - we're starting a new chapter." MacDonald described the new facility - which will boast a Career Center for job training and skill development, a Wellness Center that will offer a variety of health screenings and access to preventative care, a Center for Senior Rights and much more - as "a place of acceptance, community and love... a place where we honor and respect our seniors." The building will also be designed to accommodate increased demand for healthy meals, with an estimation, per MacDonald, of over 120,000 expected to be served annually. The building will have an intergenerational slant, with partnerships with the Boys & Girls Club, College of the Canyons, YMCA and Henry Mayo Hospital - but some programming and services have yet to be determined. "Over the next 10 months," said MacDonald, "We will listen closely to what you want for your future." That's because, according to the Campaign team, the focus isn't just on the building, but the people who need it the most. "We're not just building a Center, we're building a community of our own - one that makes people healthier and wiser," said Campaign Co-chair Peggy Rasmussen. 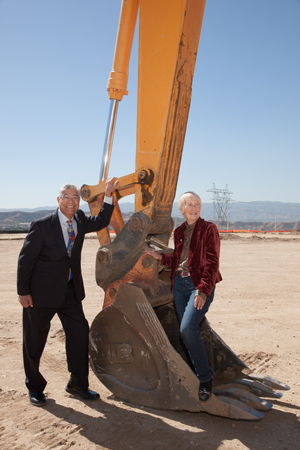 Councilmembers Bill Miranda and Laurene Weste take a closer look at the site's construction equipment. It's a plan the County of Los Angeles and the City of Santa Clarita are fully behind; both contributed $3 million each at the start of the Campaign, with the City officially raising their donation amount at the ground-breaking event. "The City Council approved an additional $500,000 contribution," said City of Santa Clarita Mayor Cameron Smyth. "This is what local government is for - to find partnerships and help serve." According to Rasmussen, it is expected that a contractor will be selected next week, with an official start to construction around Thanksgiving. "With an estimated 10 months of construction, we're looking at September or October when we're able to go in the front door," she said. "Today, we still have $1 million to raise," said Campaign Co-chair Todd Stevens. "But we couldn't have gotten to this place without our generous donors, many of whom are here now. Without them, today would not be possible. We're confident that the community will help us close the funding gap and raise the remaining monies needed." 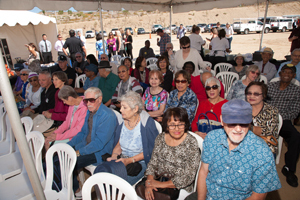 Members of the SCV Senior Center smile for the camera at the Center groundbreaking event. Donations can be made online at www.NewSeniorCenter.com or by writing a check to SCVCOA-Building Fund (Memo: Capital Campaign) and mailing it to 22900 Market Street, Santa Clarita, CA 91321. You can also in a credit-card donation to the SCV Senior Center (661-259-9444). Permanent on-site plaques are available now at donation points of $500, $1,000, $2,500 and $5,000. Plaques can be made in memory or honor of an individual, or can be in recognition of a donation. Contact Executive Director Kevin MacDonald at 661-259-9444, extension 123, to make arrangements. Do you own a business? Volunteer with a youth group? Are part of a philanthropic organization? Reach out to Kevin MacDonald, who will connect you with the Campaign's marketing coordinator. Get exposure for your good deed while making a difference in the lives of SCV seniors. Contact Executive Director Kevin MacDonald to arrange gifts of stock, securities and more (661-259-9444, extension 123). 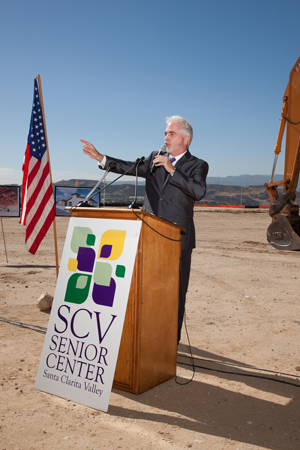 The SCV Senior Center New Building Campaign is currently soliciting donations and community partnerships. Donations can be made online at www.NewSeniorCenter.com; by writing a check to SCVCOA-Building Fund (Memo: Capital Campaign) and mailing it to 22900 Market Street, Santa Clarita, CA 91321; calling in a credit-card donation to the SCV Senior Center (661-259-9444) or working with Executive Director MacDonald to arrange gifts of stock, securities and more (661-259-9444, extension 123). Building naming opportunities, commemorative plaques and more are available and donations are tax deductible. 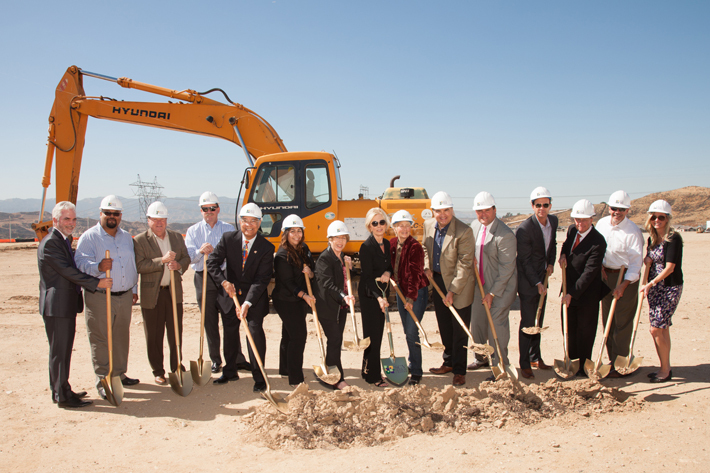 Over 150 guests, including state and local dignitaries, the Campaign team, SCV Senior Center board members and seniors from the Center attended the Groundbreaking, which was catered courtesy of Rattler's Bar B Que. 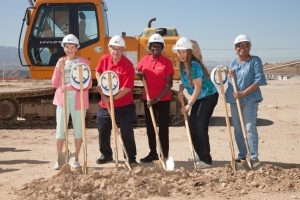 The 2.5-acre site of the new building can be found on Golden Valley Road in Santa Clarita and will serve SCV's growing senior population and those who love them. Exciting additions to the new Center include an expanded Adult Day Program, Health & Wellness Center, Employment and Financial Centers; Culinary Arts Kitchen; multi-purpose rooms; a "living room" with fireplace and socialization area; and much more.